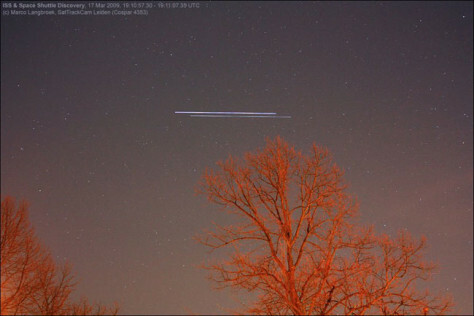 NASA's space shuttle Discovery and the International Space Station streak across the sky in this time-lapsed image, taken over Leiden, The Netherlands, just before the two spacecraft docked on March 17, 2009 during the STS-119 mission. The shuttle is the object slightly fainter and lower in the sky. Movement is from right to left.